Grandma Sycamore's is BACK as an option for dairy-free, egg-free, nut-free homes. If you have been a fan of theirs in the past, you TOO, may be quite happy to hear you may once again be able to enjoy this product. They also state to have NO artificial colors, flavors, preservatives or high fructose corn syrup! Back in October of 2010, I posted about the fact we could NO longer enjoy this bread because MILK was listed as an ingredient. We've kept it around for my husband because it his favorite bread. My 9 year old was making toast for her younger brother, and threw some in the toaster. When I realized what she had done, she quickly stated "Mom, I read the ingredients. There's NO milk in it". And SURE ENOUGH! She was correct! Grandma Sycamore's Home-Made White Bread, Earthgrains Baking Companies, Inc., Horsham, PA. 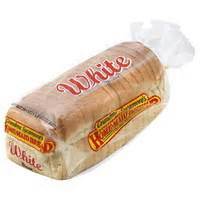 Ingredients include: ENRICHED FLOUR [WHEAT FLOUR, MALTED BARLEY FLOUR, REDUCED IRON, NIACIN, THIAMIN MONONITRATE (VITAMIN B1), RIBOFLAVIN (VITAMIN B2), FOLIC ACID], WATER, SUGAR, SALT, POTATO FLOUR, CULTURED WHEAT FLOUR, YEAST, GRAIN VINEGAR, SOY LECITHIN, CALCIUM SULFATE, SOY FLOUR. I called the above listed number and spoke at length with a manager in their Consumer Relations department in regard to this change and their cleaning processes. He went in depth with me about their manufacturing facilities and product lines, and their cleaning protocol and labeling practices. I suggest you do the same if you have any concerns. This is a company which is well aware of allergy concerns and is MORE than willing to speak with the public about what they are doing to help keep us ALL safe. My son had 6 pieces with his favorite cinnamon spread! Be sure to pass the update on to any other milk allergic families you know!